In primary school, one of my best friends was Adele – and her mother Michelle was (and I assume still is) an amazing cook. At Adele’s house – I’ll call it that because that’s what it was to me – I was introduced to foods like tabbouleh, and stuffed zucchinis. Michelle might not even remember making them but I still remember going home and telling my Mum that I wanted stuffed zucchinis for dinner again the next night. 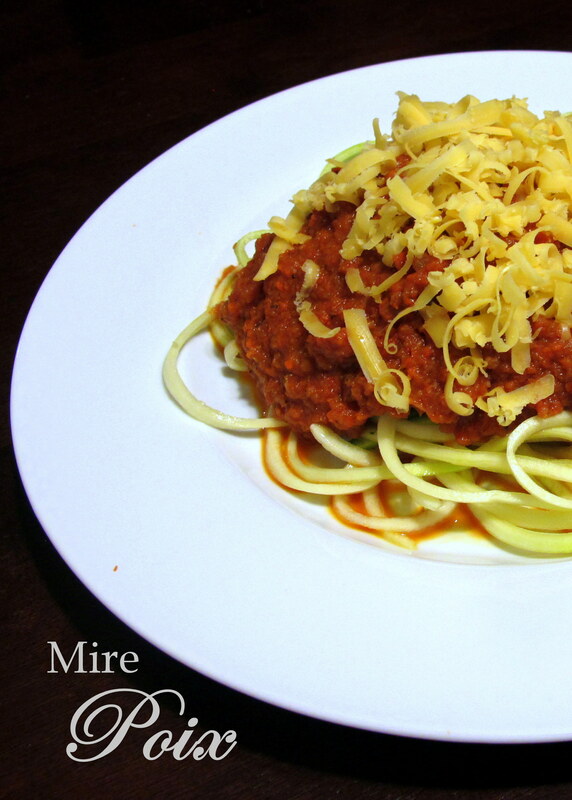 Come to think of it, I normally went home telling Mum that I wanted what Michelle had cooked… sorry Mum! 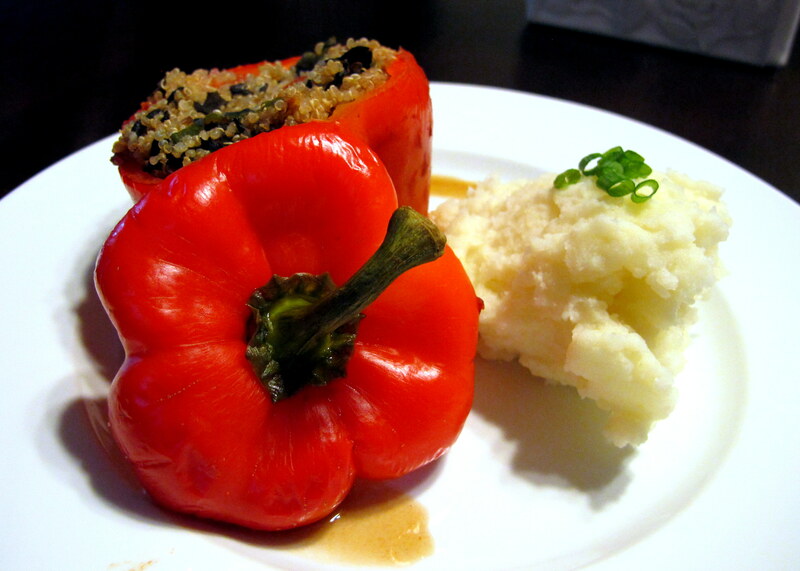 Cut to a decade or so later – jeez, I feel old – and Ev’s mum made capsicums (bell peppers) stuffed with rice and pork mince – my love for stuffed vegetables was reignited. 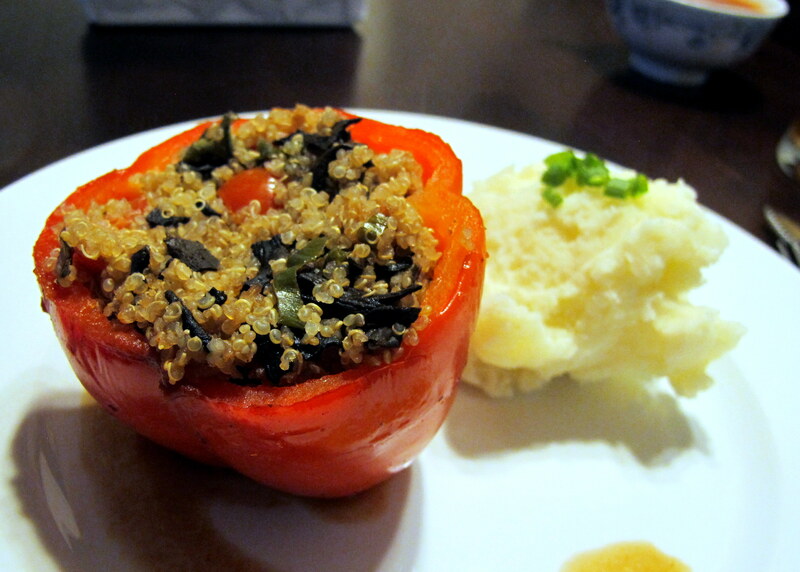 I have made stuffed capsicums a few times over the last couple of years – sometimes with rice, meat and veggies, sometimes just veggies – but this is the first time I’ve used quinoa… mainly because the local supermarket was closing down and the stuff was actually affordable for once. I don’t know about quinoa prices in Australia but they can be pretty ridiculous in Seattle. Maybe I should try Costco. Red capsicums are lower in FODMAPs than the green variety, which is a good thing, considering they’re much tastier as well. Sadly, they’re also more expensive… but you can’t win ’em all. 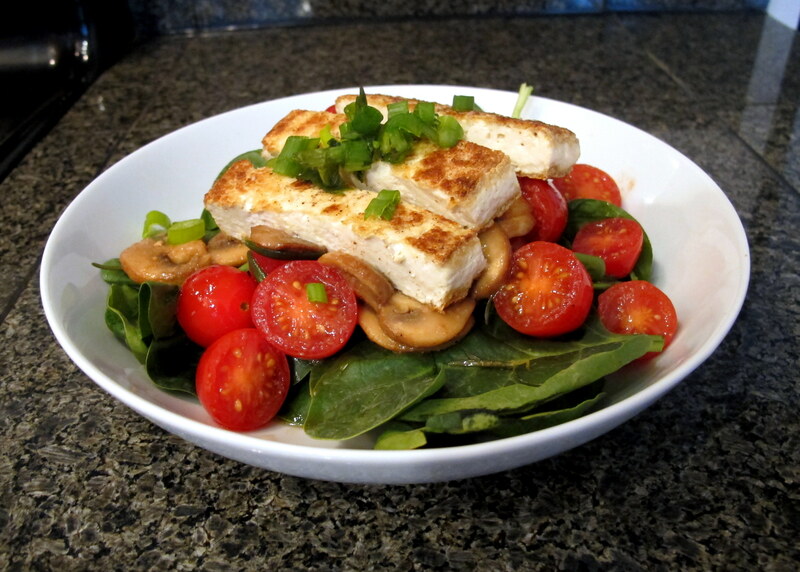 Mushrooms, while low in fructose and fructans, are higher in polyols. The green part of chives are much lower in fructans than the white bases of the stems, although some are still sensitive enough to react. 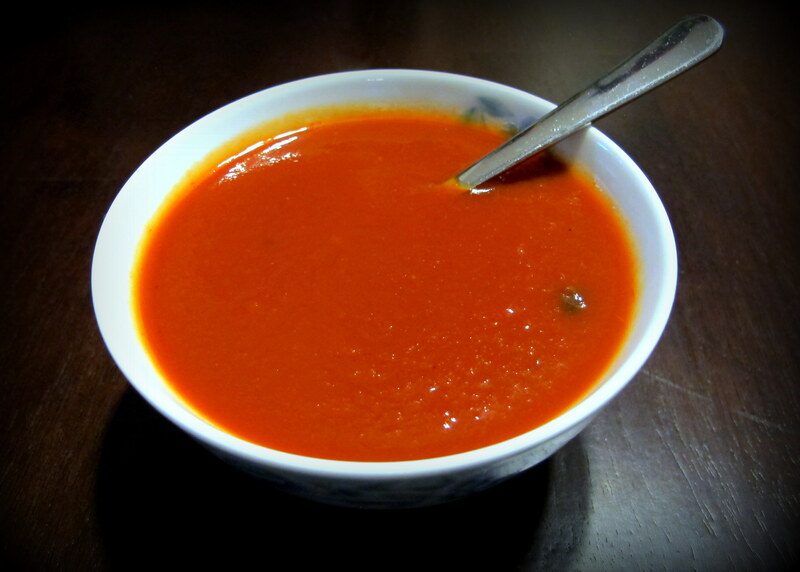 Cherry tomatoes and tomato puree are low in fructose, but some might be sensitive to their acidity or salicylates. 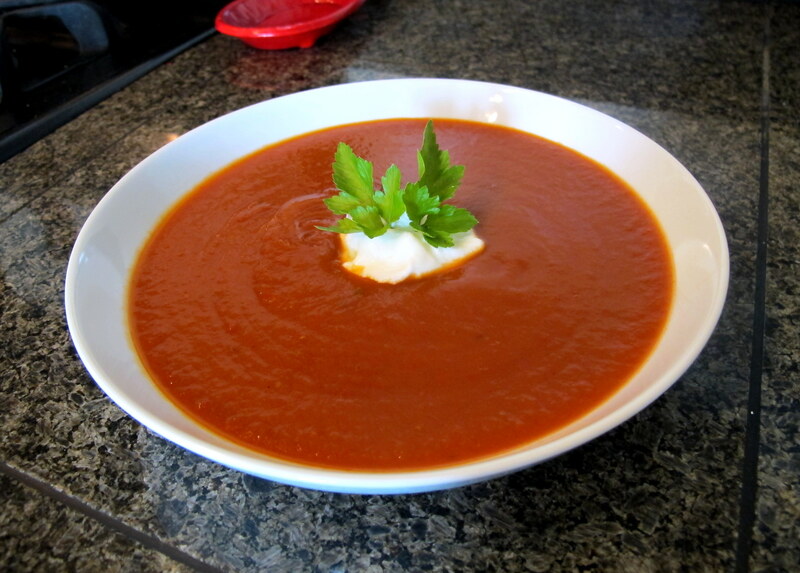 Homemade vegetable stock can be tolerated by some fructose malabsorbers, because the onion (and/or garlic) itself isn’t eaten but removed from the liquid . 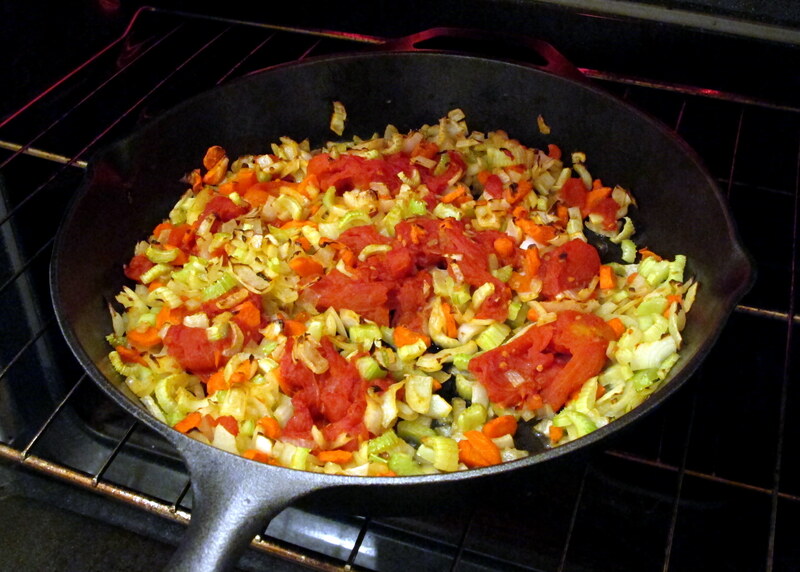 Some fructans do make the transition between onion flesh and stock water, though, so it can still trigger a reaction in those who are particularly sensitive to fructans. 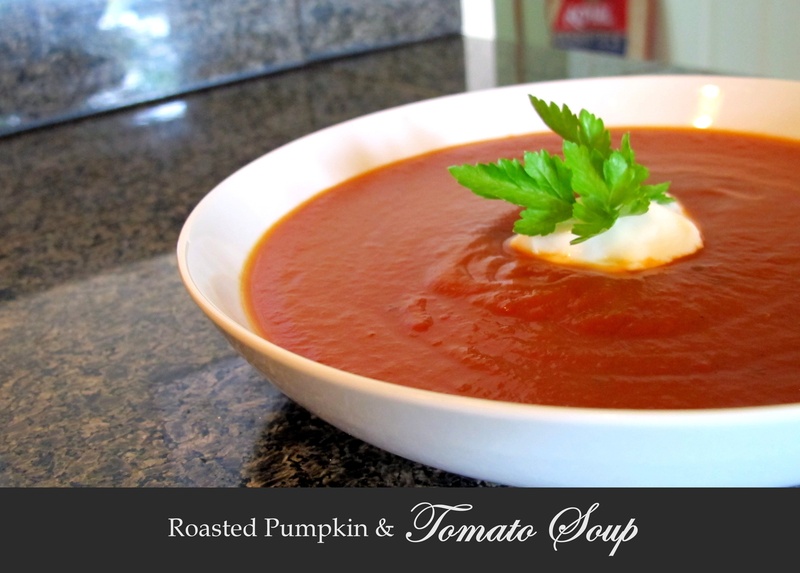 It can be made more fructose friendly by omitting the onion/garlic in the cooking process. I will put up a “How to make Stock” post soon. Firstly, you need to cook the quinoa. 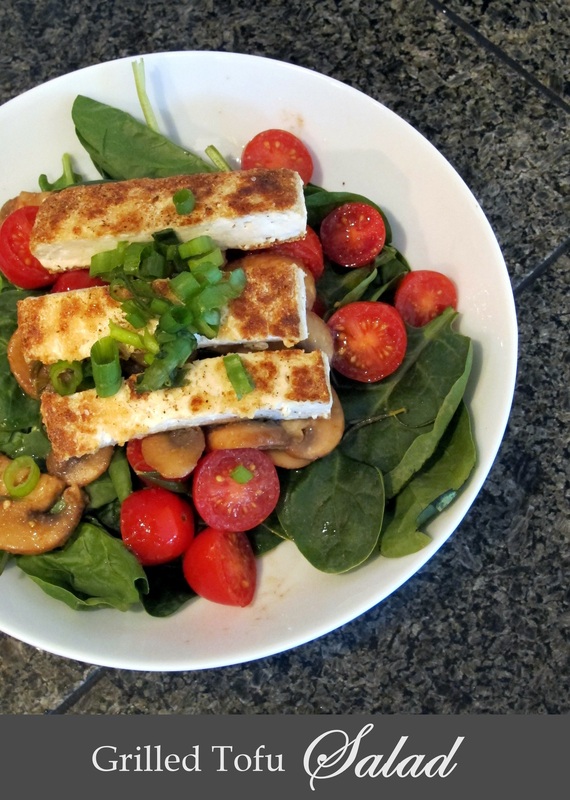 This recipe can be made with leftover quinoa, if you have it, but if you don’t you will need 2 parts fluid to 1 part quinoa. 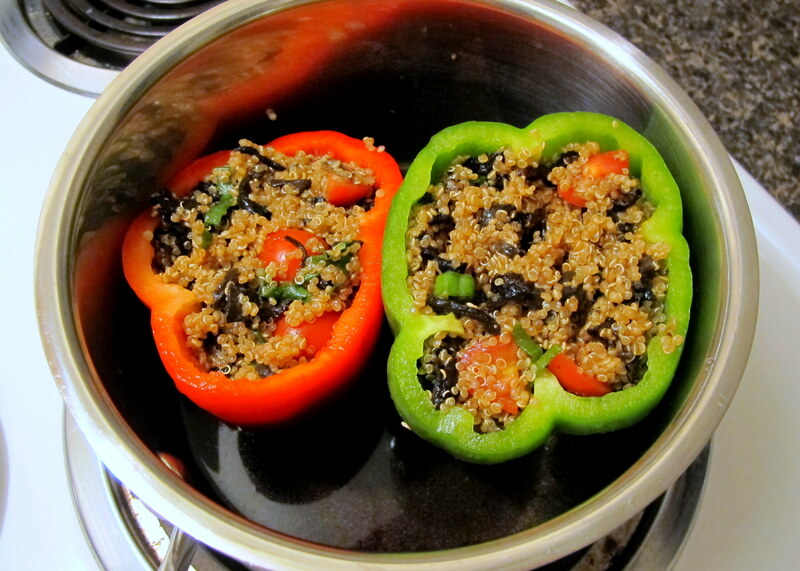 I used half a cup of water and FF veggie stock each (1 cup total) and half a cup of uncooked white quinoa. 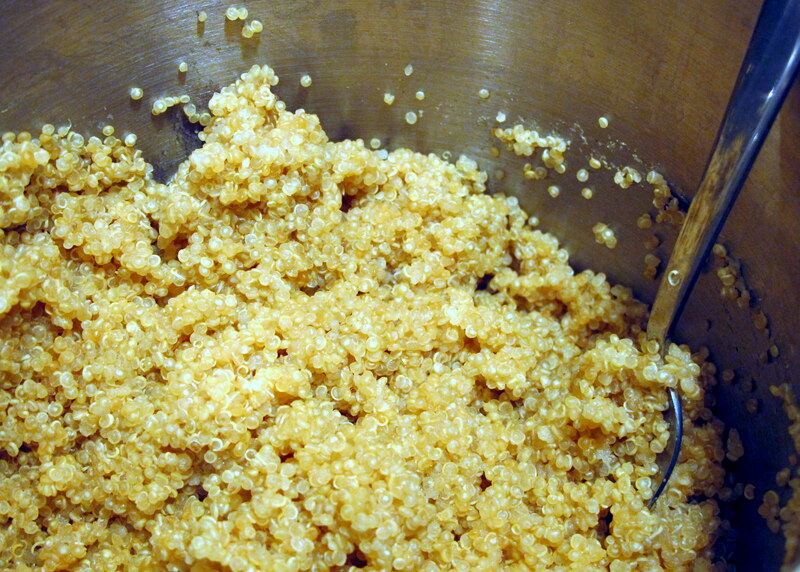 In a small saucepan, bring the water, stock and quinoa to the boil and then immediately reduce to a low heat and put the lid on. Just leave it until all the fluids have been absorbed by the grains, checking every 5 minutes. Mine took approx. 10 minutes. Give it a stir to make sure all the fluids have disappeared and remove it from the heat. Set it aside for later. 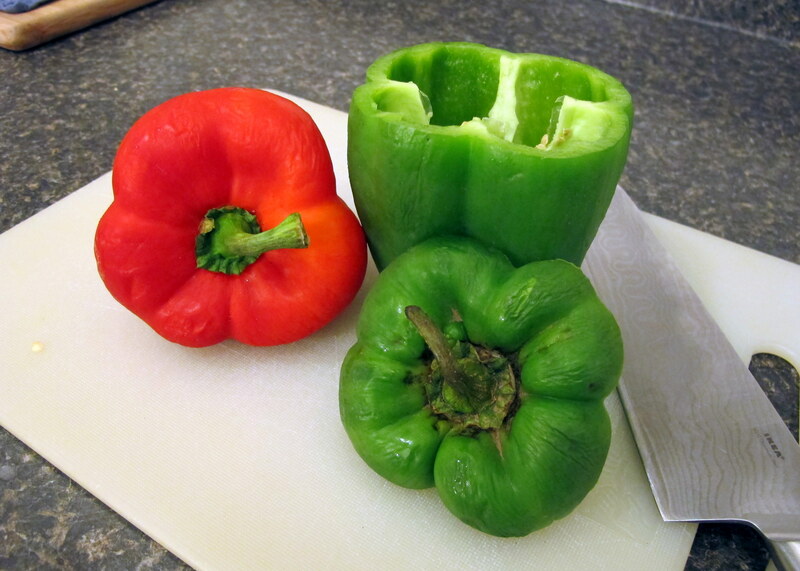 Top and core your capsicums (remember I said red capsicums are FODMAPs safe – well the green one was for Ev). 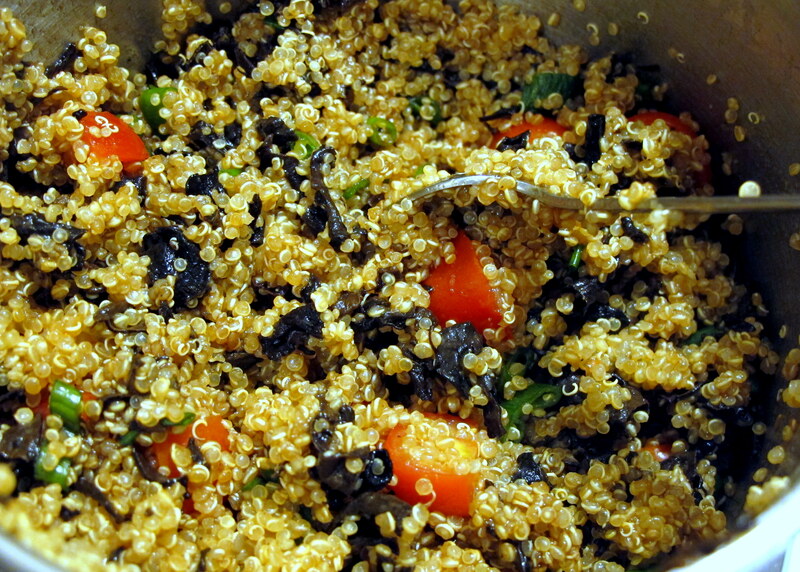 Finely slice the mushrooms, cherry tomatoes and green chives and stir through the cooked quinoa. Add in the GF soy sauce and check the taste; adjust as required. 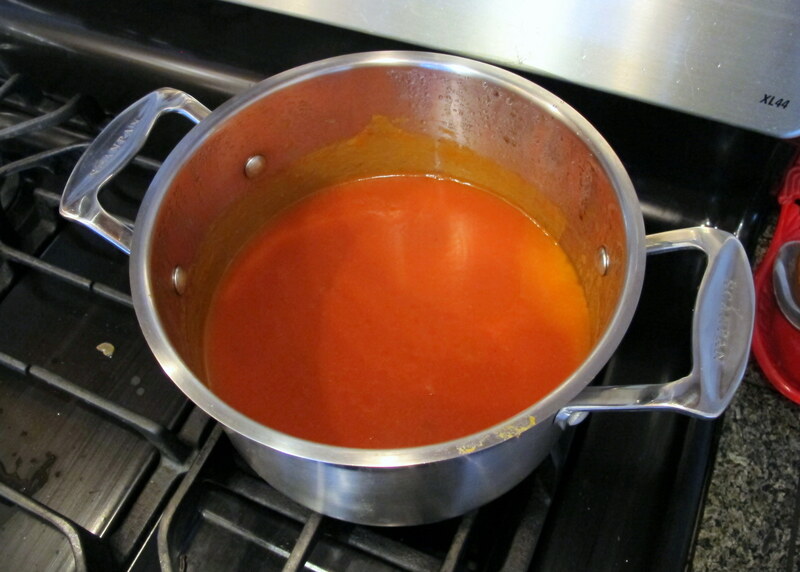 Pour the second half a cup of veggie stock and the can of tomato puree into a saucepan that will fit the two capsicums (or as many as you are making) snugly and keep them standing upright. Give the fluids a stir so that they combine. 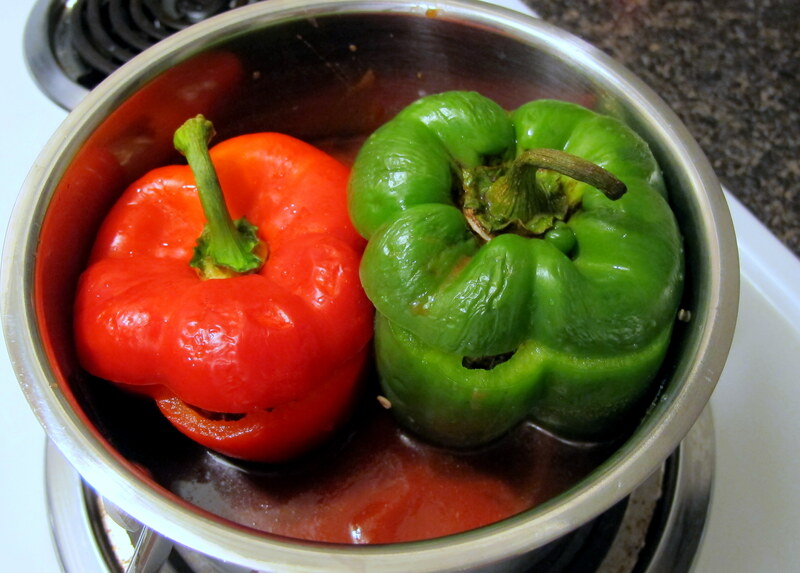 You can fill the capsicums before you put them in the saucepan or after – it really won’t make a difference but I find filling them first easier, leaving just a little to top up once they’re in the sauce, to prevent spillage while you’re trying to squash them together. 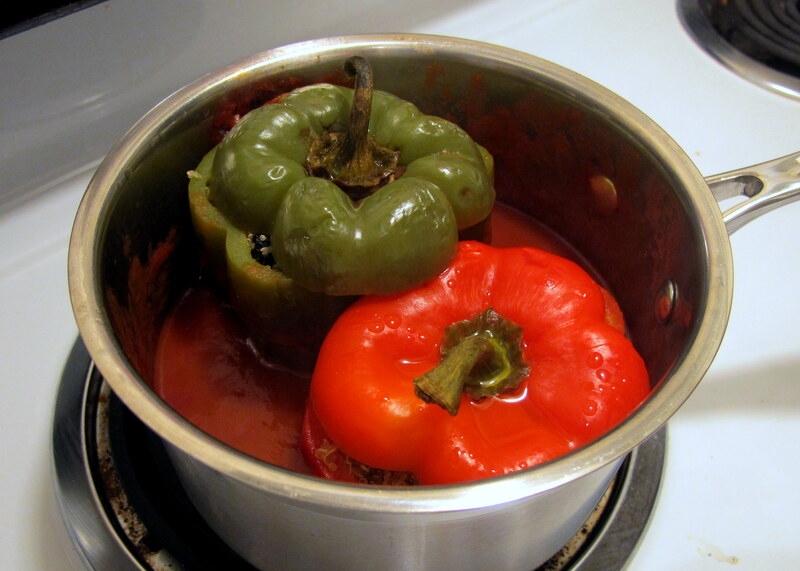 Put the tops on, and the lid onto the saucepan, and you can sit aside until you’re ready to cook as they only take 15 minutes. 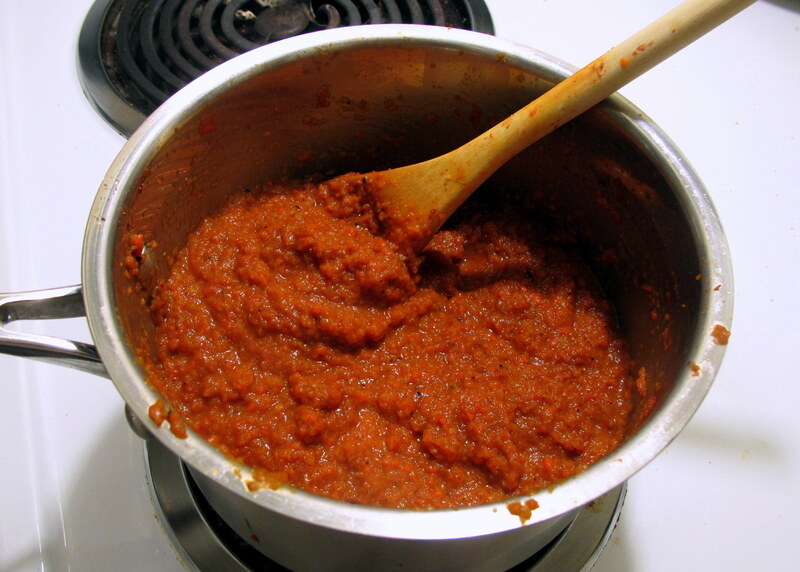 When you are ready, turn the stove’s heat onto high and bring the sauce to the boil before turning it down to a medium heat. Set the timer for 15 minutes and leave it be. 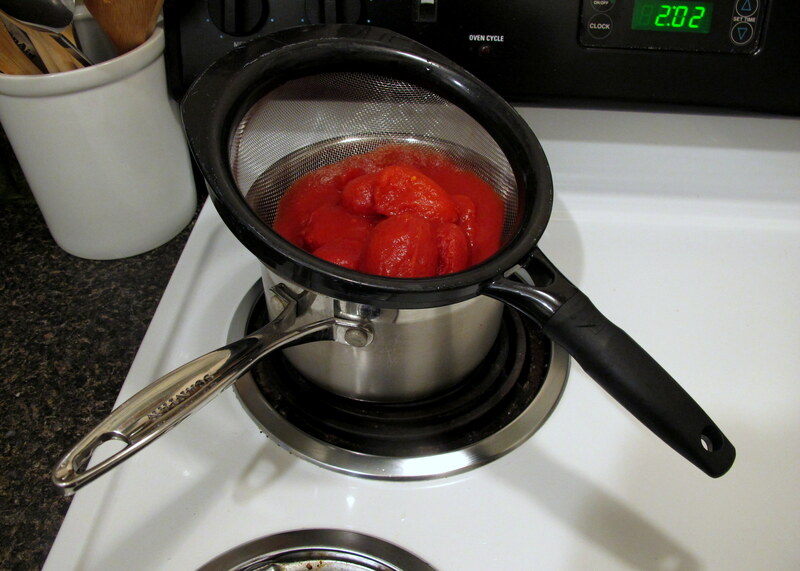 After 15 to 20 minutes, the sauce will have cooked and steamed the capsicums – hence leaving the lid on. They should look similar to the next photo. 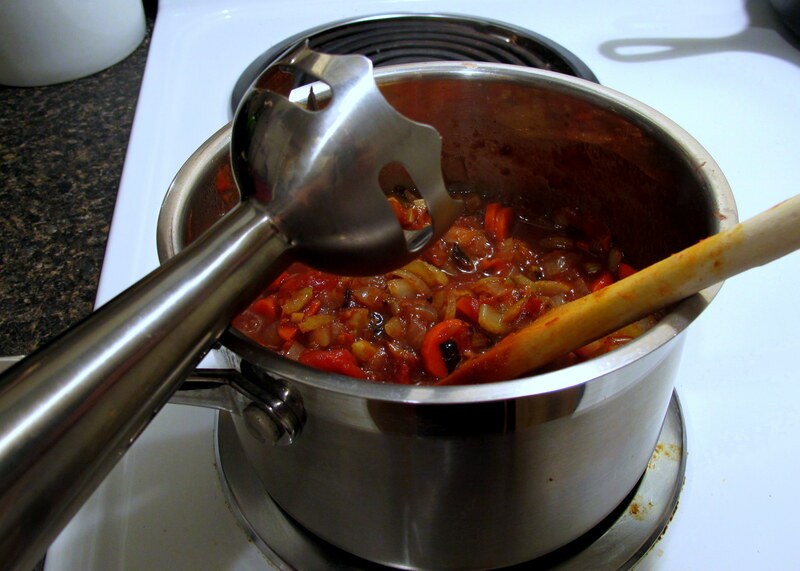 I use tongs to gently lift the capsicum from the pot, let it drip for a few seconds and then place it on a dinner plate I have sitting near by. Serve with mashed potatoes, or possibly some polenta with cheese. 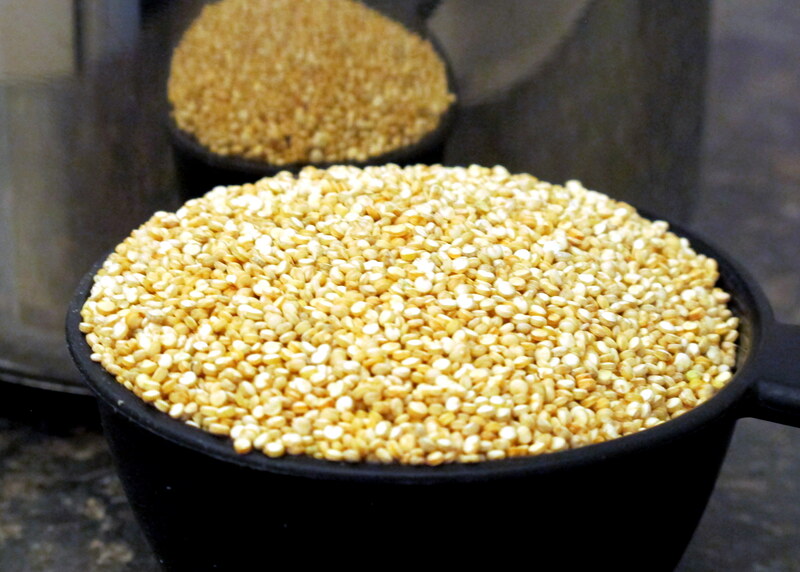 Ev and I have tried so hard to find corn that has been milled finely enough to make good polenta in Seattle – all we can find is “grits,” which doesn’t do the job at all. 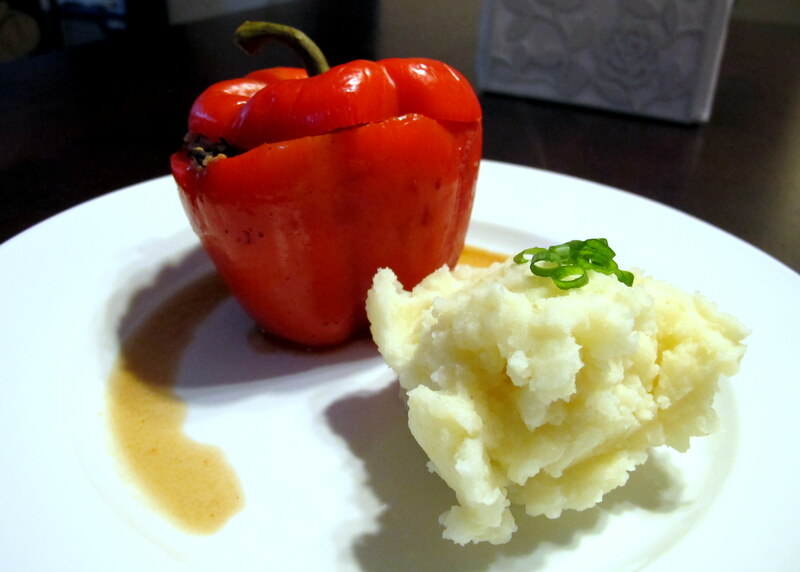 Pour the sauce from the cooking process into a small bowl and use it on the capsicum or mashed potatoes. It goes well with both. 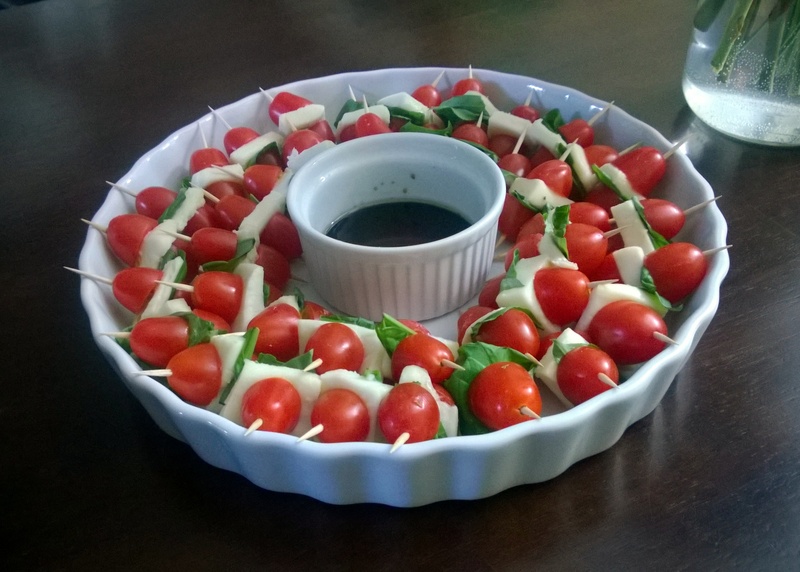 Enjoy – but a word of warning, the capsicums are deceptive and are much more filling than they look. Don’t load up too much on the mashed potatoes, or you might not finish them. 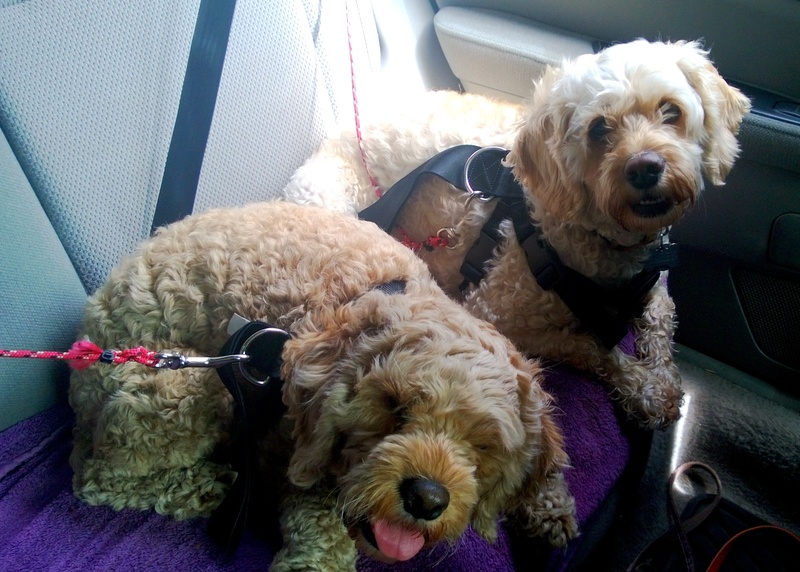 After taking Bailey and Nellie to Marymoor Dog Park this morning, Ev and I decided that we had pizza cravings. 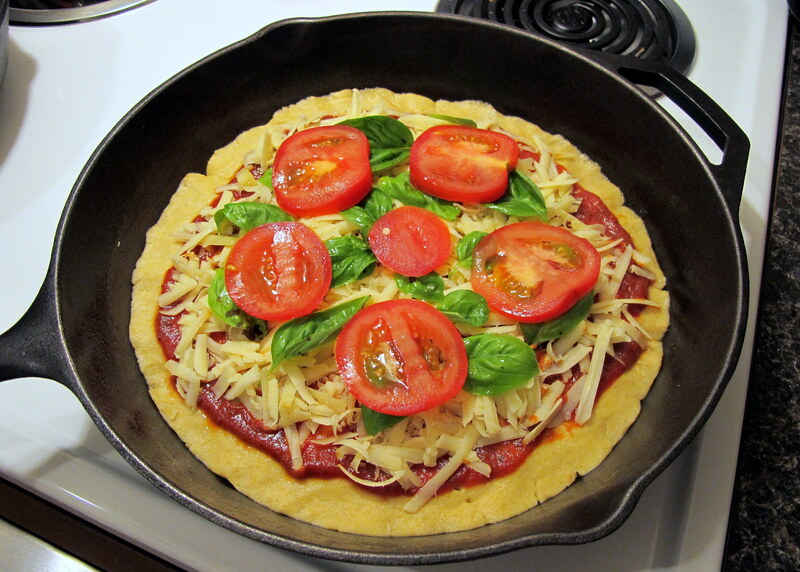 However, anyone who has tried pre-made GF pizza bases can attest that they are very hit and miss… mostly miss. 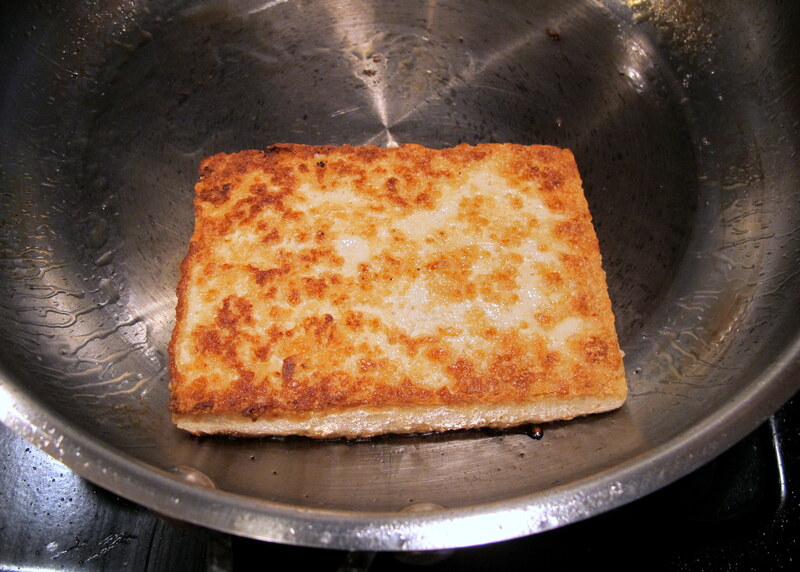 Usually bland (or just plain gross), lifeless and with questionable textures; I have never had one that can be held like a proper pizza slice once cooked. They always turn soggy. In fact, you might as well be putting the toppings on top of cardboard. Faced with the dilemma of a pizza craving and no reliable way to satisfy it, I began to formulate a recipe on our drive home. 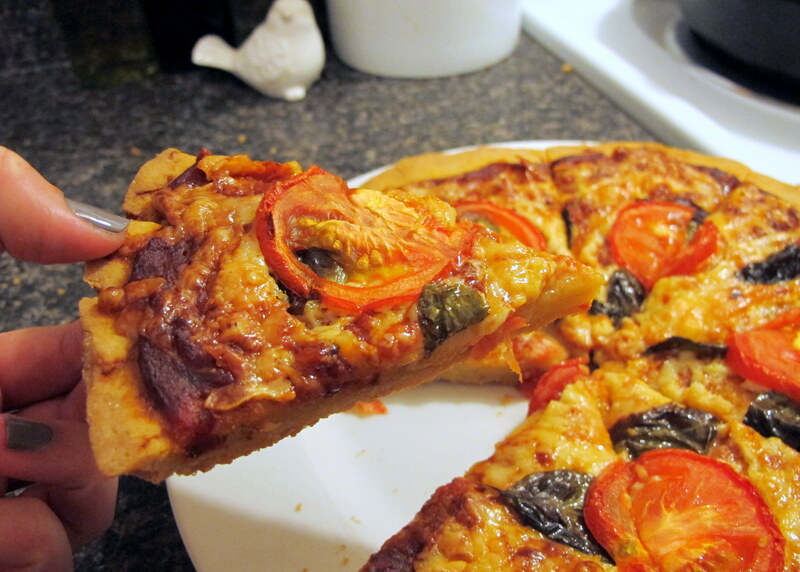 Often after making scones, I would think to myself that they weren’t far off being a slightly breadish pizza base. So that is where I started my planning. 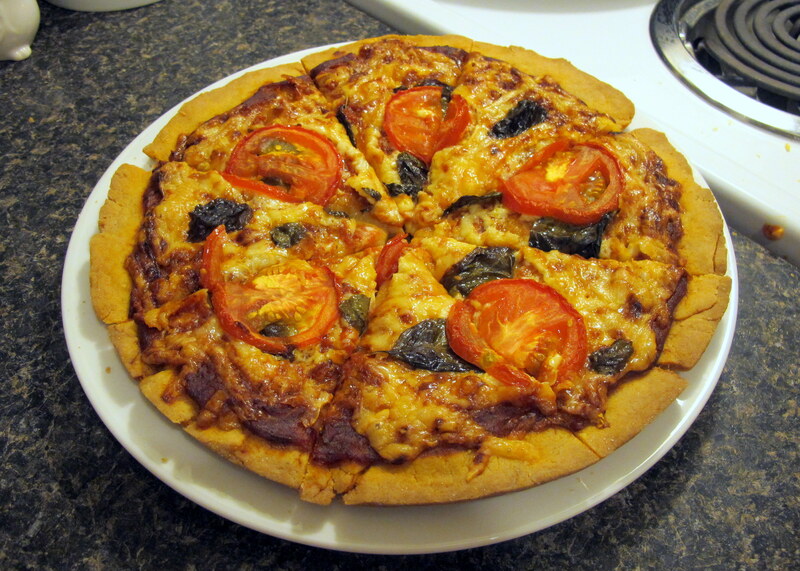 When we got home, I researched pizza recipes (gluten free and normal) as well as yeast, which is where I discovered that you had to activate it… duh! Thank goodness for the internet! Makes two approx 12″ pizza bases. 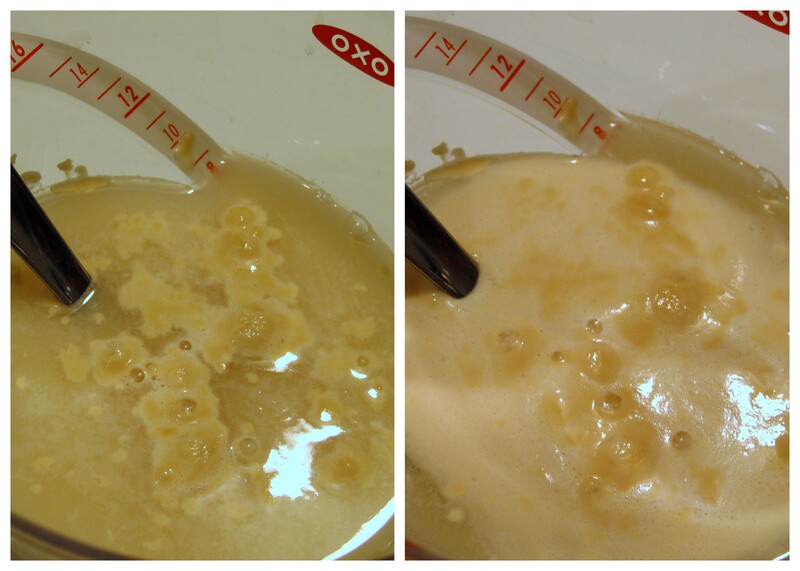 Activate the yeast in 1 cup warm water/dextrose mixture (I used 1/4 cup boiling mixed with 3/4 cup tap – you should be able to comfortably hold your finger in there). Let it sit for 10 minutes and allow it to build a foam. If it doesn’t, either the yeast might be too old or the water was too hot and damaged it. You can see the before and after shots below. 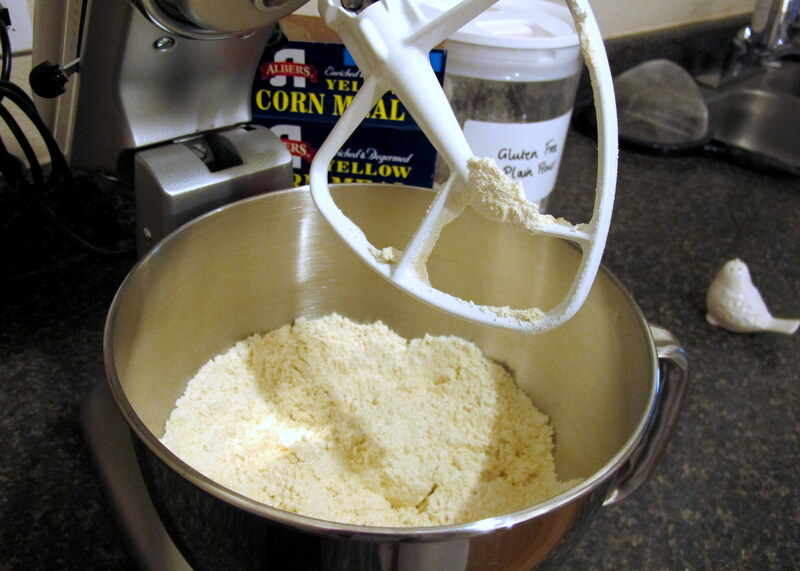 Pour all of the dry ingredients, into the bowl of your stand mixer and blend them thoroughly for 2-3 minutes on a low speed. 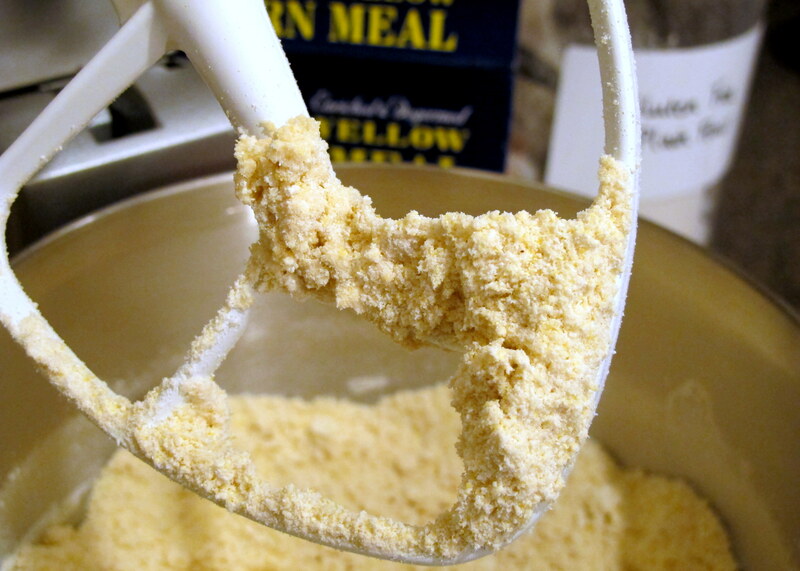 Pour in the activated yeast and blend thoroughly on a slow speed for 2-3 minutes, until it resembles bread crumbs. 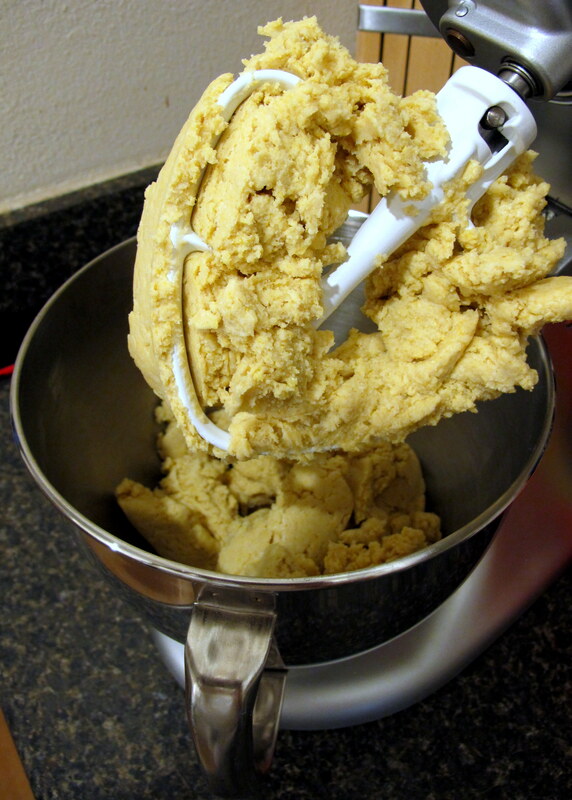 Add in the wet ingredients and mix on a slow speed, then a medium speed, until well combined. 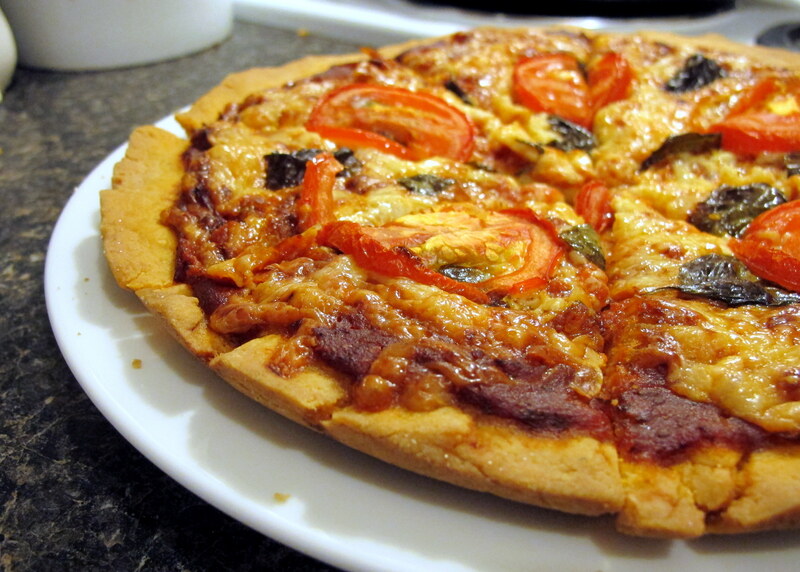 Tinker with flour and water as necessary to reach the elastic texture required of pizza dough. 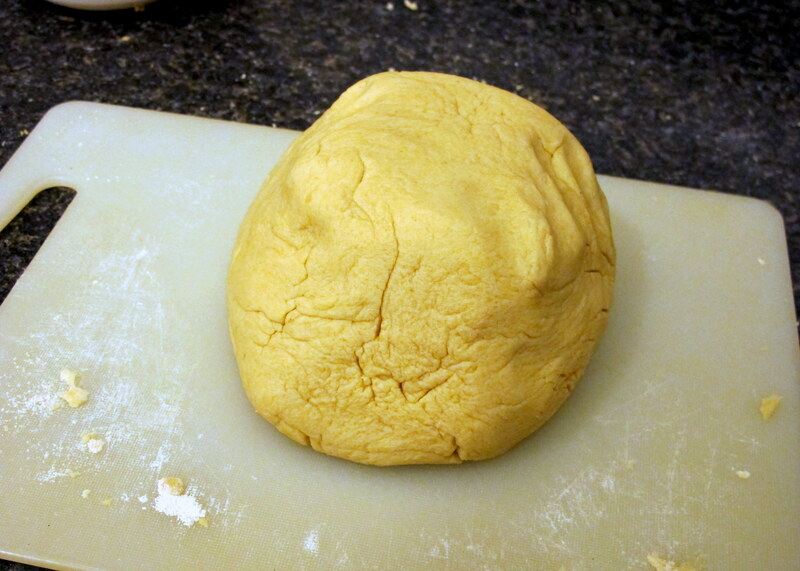 Place the dough in a warmish location, cover it with plastic wrap and let it rise for 2-3 hours. I only had time for two hours, it definitely rose – before and after shots below – but not by as much as normal pizza dough does when I’ve made that. However, our kitchen was quite cold today, which was very out of character but I’m sure it contributed. 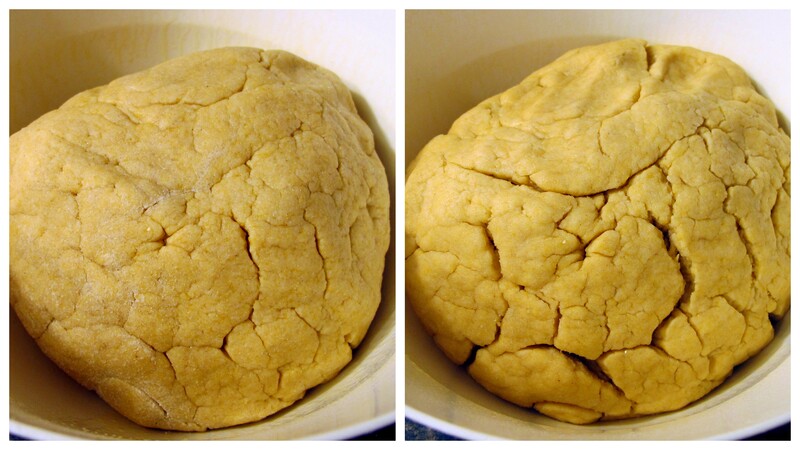 Next, go to town kneading that dough. This is where I let Evgeny step in; he was punching, throwing/catching and smooshing it until it really did resemble real pizza dough! Exciting! This took between 5 to 10 minutes. 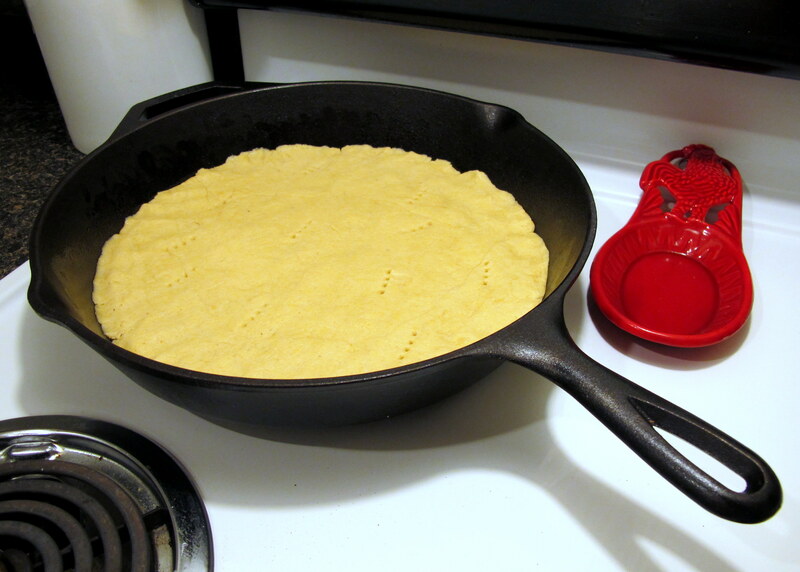 Split your dough in two and press into two greased pizza pans/fry pans/biscuit trays or anything that can take a round shape and is oven safe. Stab some holes in there for good measure. Dress your pizza up however you’d like it. 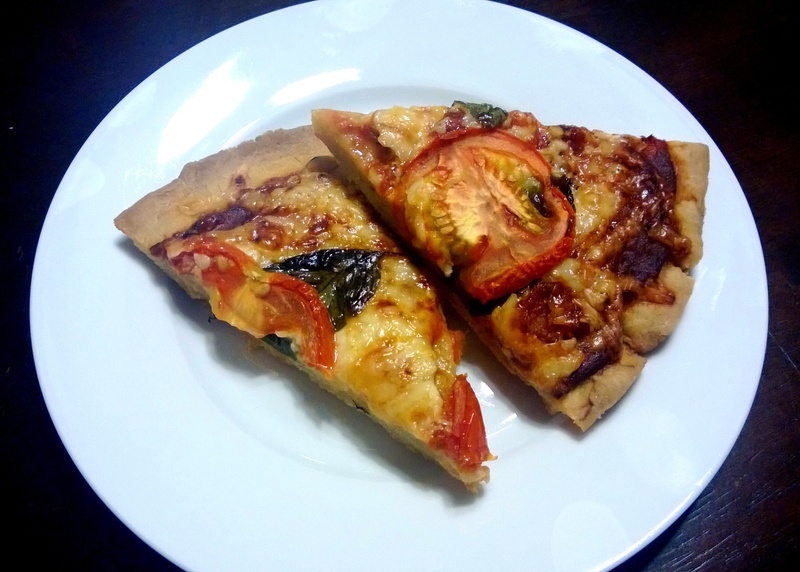 I used a tomato based pizza sauce (recipe at the bottom of this page), basil leaves (which should have gone under the cheese), cheese and sliced tomato. I was really testing out my stomach tonight – I’ve had new-found reflux issues over the last month… oh joy. Bake for 40 minutes at 190 C/375 F. If you can’t fit both pans on the one shelf, swap them halfway through baking. If you have a fan-forced oven, maybe this isn’t necessary? Our oven is pretty ancient so I can’t help you with that one, sorry. PIZZA YOU CAN HOLD! 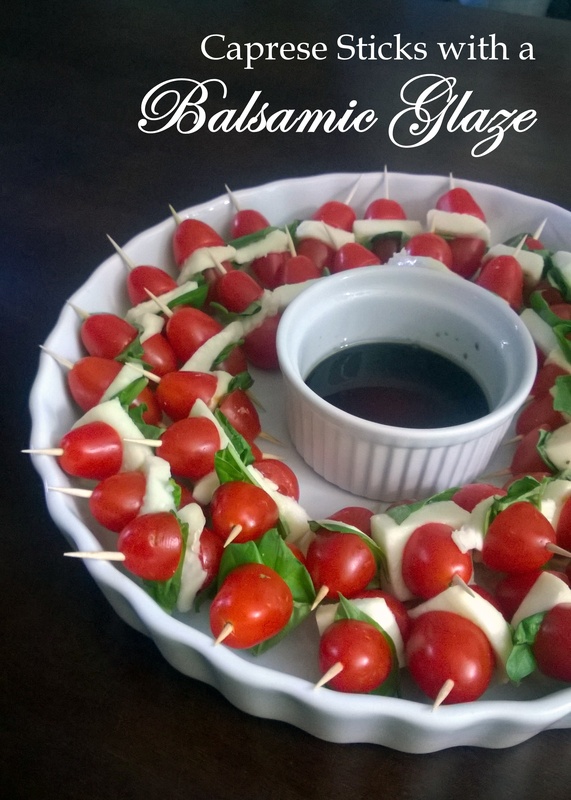 FINGER FOOD IS BACK! It got a “not bad” – think tone of disbelief – from Ev and he is pretty hard to please/can still eat wheat 🙂 I definitely enjoyed it. If you try this, please let me know how it turns out and if you can suggest any improvements. 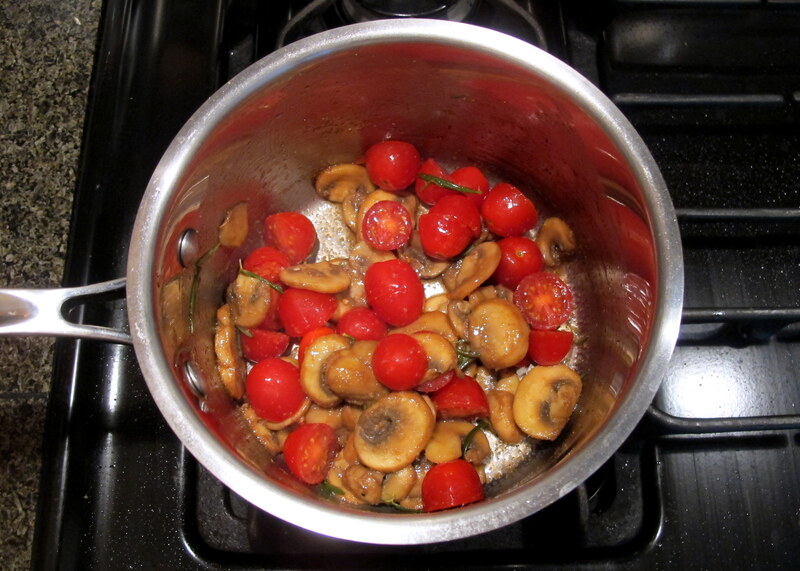 Combine the above, bring to the boil and let simmer for 20 minutes to half an hour. 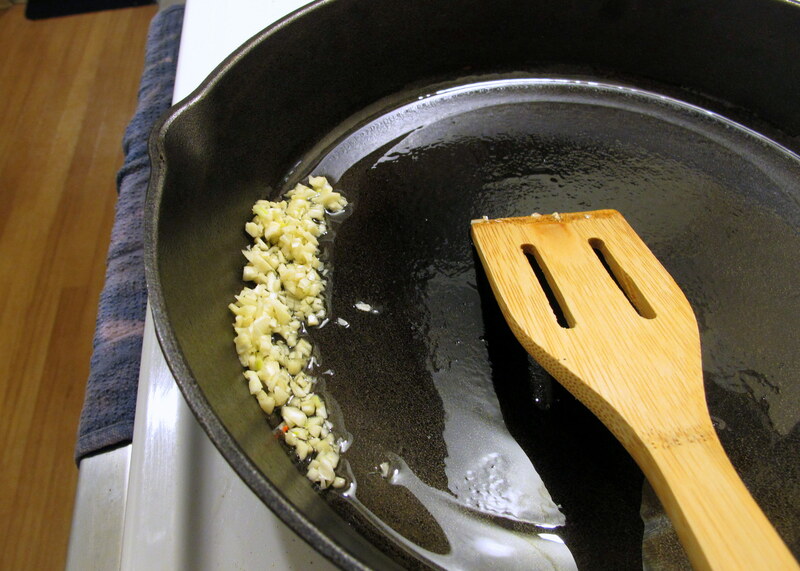 Stir thoroughly to recombine ingredients before using on your pizza base. Go back to following the steps above. 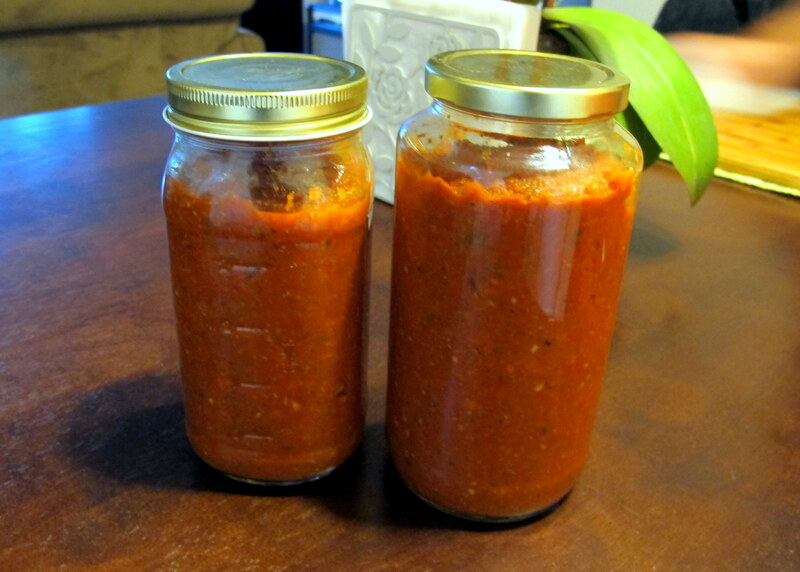 Of course, if too much tomato is a trigger for your FM you don’t have to use a traditional pizza sauce. Try a basil pesto sauce or even some infused olive oil after blind baking the pizza a little; I’ve even heard of cream based sauces being used as a pizza sauce but I’m not sure I’d enjoy that very much… you might, though!